After departing Kalumnos, we headed to Kos, our last destination of our MDFV cruise around the Greek islands. 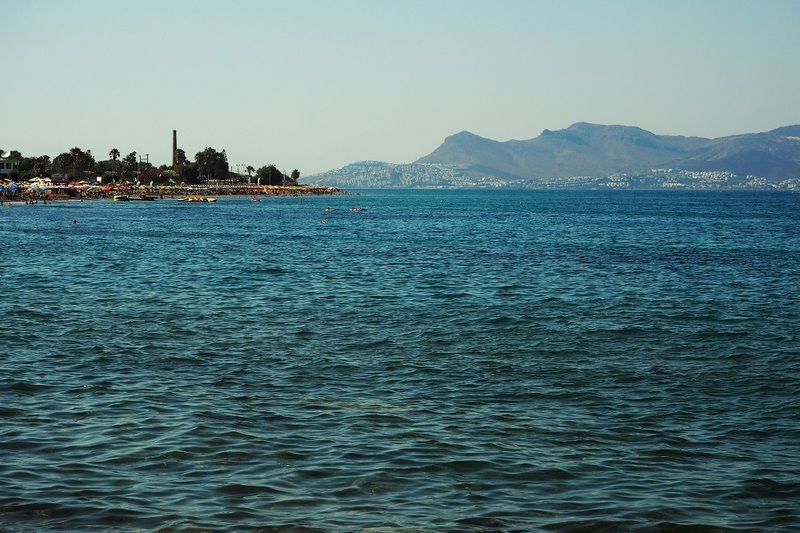 Kos is the second biggest of the Dodecanese island after Rhodes and is popular for its history since ancient times. It has been occupied through the years from Turkish, Italians, English, Germans but it was always freed by the Greeks and given back to its people. Sailing between the sea borders of Greece and Turkey on our way to Kos was such a thrilling experience, to see how close these countries are in reality and not just on the map is the only time you can realise how close they REALLY are! With the famous palm trees and colourful boats the one lined next to the other, this is a photographer’s heaven and every travel blogger’s dream background. Strolling along this bustling promenade and soaking up the Greek sunshine is one of the best things to do in Kos. The island is safe-as it goes with all Greek islands-and you can relax at the cafes and bars while watching the sunset. Here there are also opportunities for water sports and day trips to Turkey or other small Greek islands, so if you are into sailing activities or exploring your surroundings this is the place to be. If you are an admirer of the Greek history, then Asclepeion will keep you mesmerised. Asclepius was the ancient God of Greek Medicine and this is the birthplace of modern medicine. If you have ever noticed the symbol of a snake wrapped around a staff outside pharmacies, this is reminiscent of the staff that Asclepius carried. In ancient Greece, Asclepeion was a healing temple, where people would visit and be treated from physical or mental diseases. There was a two step procedure followed for each patient to be treated here; firstly there was the cleansing period where patients would follow an inside and outside cleansing routine-something like a modern spa-and secondly there was the overnight stay where patients would sleep in the temple overnight and it was believed that God would visit them and heal them. And if the patients were lucky, then Asclepius himself would visit them to give advice regarding the disease. The ultimate honour for anyone visiting this place! Asclepeion, was one of the third healing temples in Greece and it is said that Hippocrates has also received his medical training on the island of Kos. What would a Greek island be without tea, locally sourced from the mountains of the island? In the centre of the town of Kos there is an closed municipal market offering local products to the tourists. From mountain tea, to honey and sesame energy balls, here you can find the most controversial souvenirs to bring back home from your family and friends. Totally the place to be if you are into clean eating and healthy dieting. Theatraki in Greek means small theater and it is as the name suggests a small theater area next to Asclepeion. Here plays are being possible up until today and the visitors can admire the stunning ancient Greek architecture; within a small space Greeks managed to create a theater of the best acoustic and functionality. This is an excellent example of the glorious Greece of ancient times! Kos harbour is very busy with tourist boats coming and going away almost every 10 minutes. 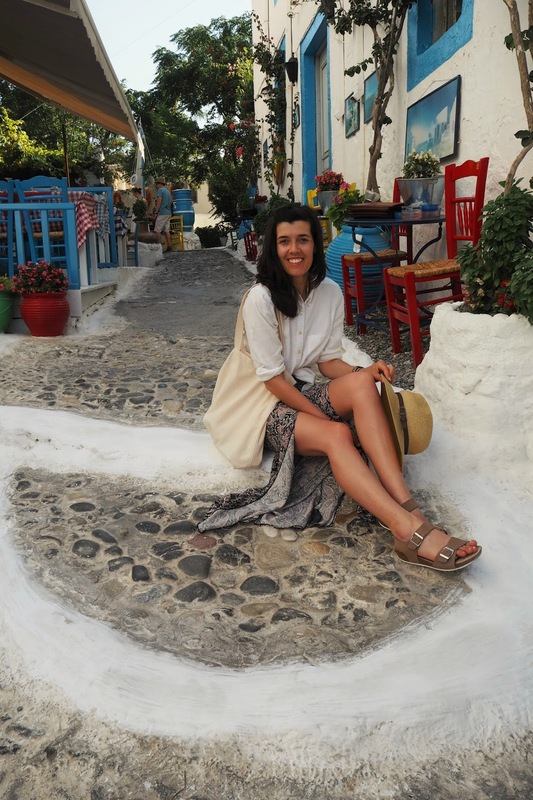 It is one of the biggest harbours I have ever seen in a Greek island and also has one of the most beautiful pathways to walk. Here you can see remainings of the ancient walls and also the Medieval city. 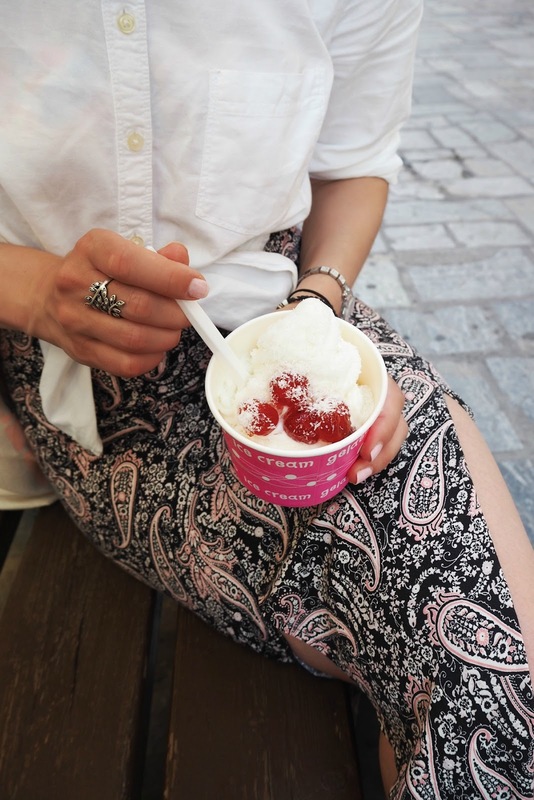 As in every corner of Greece, yogurt is in abundance and it comes in different tastes and with loads of toppings. This time I got mine with cherries and coconut, yum! Whenever I visit a restaurant or cafe in the UK, I ask them if they offer freshly squeezed orange juice and the answer is always the same ‘yes, we do have fresh orange juice’ and to my disappointment they bring me orange juice out of the bottle. However, in Greece when you order an orange juice, you don’t even have to specify what kind of orange juice-the freshly squeezed one or the cheap stuff out of the bottle-because the answer is simple, there is only one orange juice and that is the fresh one! So when in Kos, drink as much orange juice as humanly possible! It is fresh, the oranges are locally sourced, it is cheap and gives your taste buds a sensation they have never experienced before. 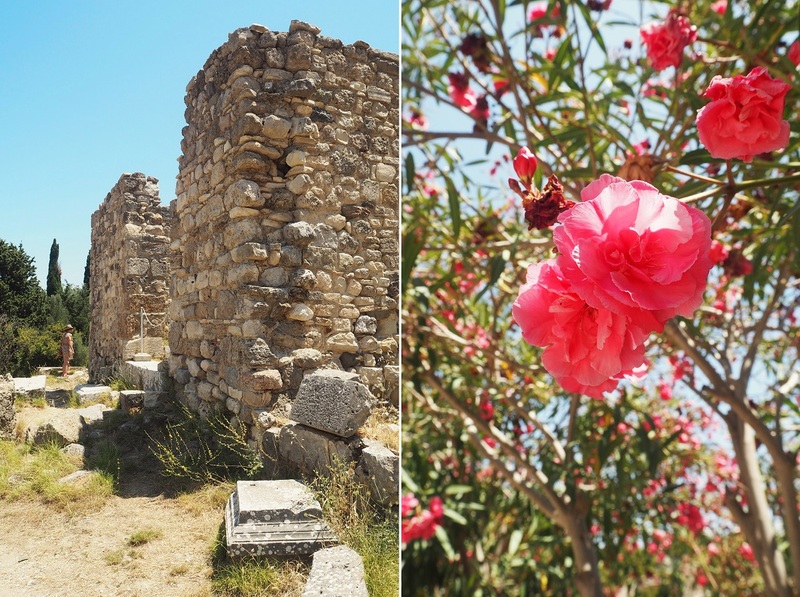 As you walk in the centre of the Kos town you will see an eye-catching gate in the centre of central square, covered with stunning, hot pink bougainvilleas. This gate used to be part of the glorious Medieval town and nowadays it leads its way into the famous ‘Bar Street’, a place of great nightlife and a reason why Kos is famous to early 20’s people and University students. Pas the gate and meet the small, local shops, scattered around the city centre. If you are feeling thirsty from the heat sit at a table of one of the many outdoor cafes, and if you feel hungry taste some bougatsa, the traditional Greek breakfast pie. The modern town of Kos has elements of the western and eastern culture and is certainly a place to explore and absorb in. Kos is one of the friendliest bicyclist cities. Kos town being flat and with narrow alleys, facilitates the usage of bikes to move around, and this is what locals have been doing for decades. If you are coming from the UK make sure to check both sides of the road in case you get confused with the driving system on the right side. The island has many bike lanes inside the Kos town and outside the city connecting small villages so it really is a great way to see the island. Whether you fancy diving in the blue waters or sitting by the beach drinking coffee, the beaches of Kos island will not disappoint you. Kos is one of these islands that have a beach in the town where people can actually swim and not just use it to anchor their boats. Expect to find many water sports activities, and a wide selection of bars and restaurants to choose from, so everyone gets happy. Also, this is the place to see the borders of Turkey; see these white houses in the picture? This is how close Turkey is located. Whether you are planning a MDFV cruise around the Greek islands or not, make sure Kos is on your travel list. This is an island that has much more to offer than it gets credit for. Rich in history, with friendly people and freshly squeezed orange juice, Kos should be on everyone’s travel radar! Have you ever been to Kos before?